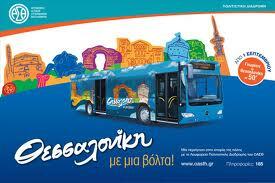 Travel to any location in the city of Thessaloniki and the surrounding region on one of the 75 bus routes available to you. It's smart, quick, economical and safe. Get to know our city and its history and see the sights in 50 minutes with the No 50 Cultural Route bus.